The national and international fame Tamil Super star style king Rajinikanth who kept his arrival a suspense to the 'Platinum Jubilee - 75 years 'Amrutha Mahotasava' of Kannada cinema arrived at the second day of the three days mega event to receive the honor for his early days in Kannada cinema. He received a grand and affectionate welcome and in his speech the highly expected one he went to the flash back mood and agreed to his counterpart Dr. Kamal Haasan's speech which he made yesterday at the inaugural of 'Amrutha Mahotsava'. At this stage and age Rajinikanth is still having a fascination to act in the role of 'Dhalavayi Muddanna' the cantankerous ruler before Tippu Sultan era from Chitradurga district of Karnataka that is focused in the trilogy by novelist Ta. Ra. Subba Rao in 'Kambani Kuyilu, Raktha Rathri and Thirugubana'. Dalavayi as a terrific ruler defeated the kings in his regime using foul methods but it was all in the interest of the people. But the same people are revoked by a village woman to put an end to the ambitious and terrific nature of Dhalavayi - the novel is partly imaginative. I was reading lot of novels in my early days in Bangalore. The devotion filled roles of Dr. Rajakumar in 'Santha Thukaram', 'Purandaradasa' etc is even more attractive for me in my life. It made me to have 'Bhakthi' in my life. Likewise the ferocious roles (Rowdravathara) also touched after seeing the films of 'Mahishasura Mardhini', 'Rakthaksha' and 'Virupaksha' in 'Sathi Shakthi' Ranadheera Kanteerava were splendid. The Puttannaji films Sharapanjara, Gejje Pooje, Bellimoda and other films like Vamsha Vruksha, Chomana Dudi.....Rajini went on mentioning his early day films. Rajini remembered the first movie he watched in life as 'Makkala Rajya' that was taken by his family members in Kannada and 'Veera Pandya Kattabomman' in Tamil was the next film I saw in my early days, he said. Kannada film makers could take up more novels for the scripts. Kannada Sahitya has further more for the films he felt. 35 years ago I did not thought that I would be a part of this 'Amrutha Mahotsava'. This is my Bhagya (blessing) given by God. Dr. Rajakumar one of the best performer increased the fascination of film goers from lakhs to crores. Kalyankumar, Udayakumar, Gubbi veeranna, BR Panthulu I remember many such persons on this occasion, said Rajini in a simple style. 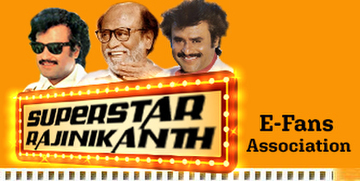 Rajini agreed to the statement made by his colleague and competitor Kamal Haasan yesterday. Filmdom is like a pond. It is not an ocean like politics. Pond waters should not be disturbed at any cost. Allow us to live like brothers and sisters, he concluded. The Tamil Superstar Rajinikanth was later garlanded with Mysore Mallige, a shawl and silver plaque was also presented to him for his early days in Kannada cinema. 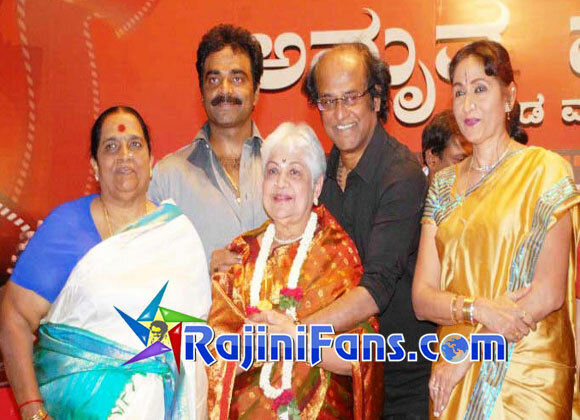 Rajini even before this honored many of the Kannada film personalities among the 108 personalities who were selected.